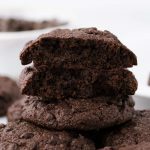 These no-fail soft batch keto double chocolate chip cookies are intensely chocolatey and fudgy. With a secret ingredient that makes these keto cookies over the top delicious! 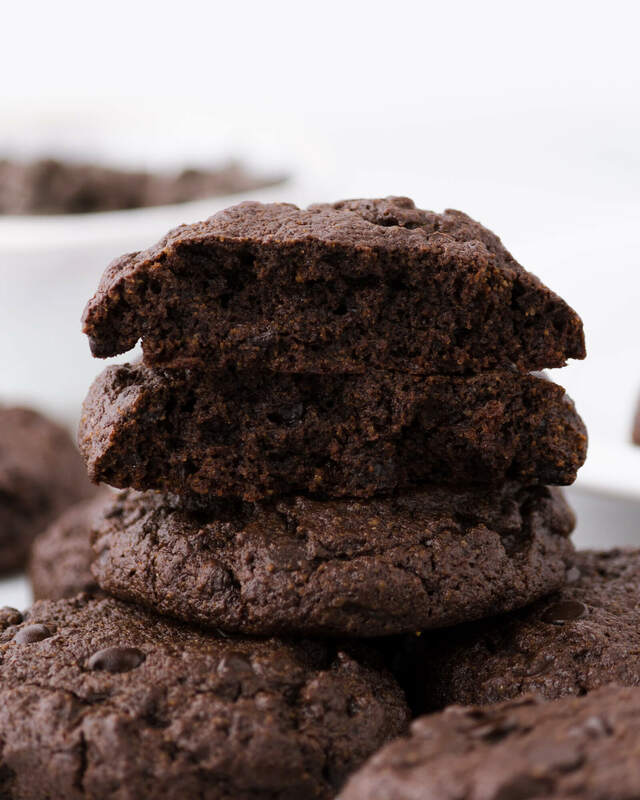 These double chocolate keto cookies are the perfect rich and chocolatey low carb treat. They’re sweet and intense, with just the right touch of salt. The best part? Since these keto chocolate cookies are so satiating, they make it easy to satisfy any chocolate craving without over-indulging! There are two simple tricks to boosting chocolate flavor, and pro pastry chefs use them all the time! Always add salt. If you’re committed to eating keto, you likely need to take in more electrolytes anyway. But salt also brings out subtle flavors and sweetness while balancing bitterness. Use earthy or umami flavors to support and round out the chocolate flavor. Previously I’ve mentioned using cinnamon in my keto brownie recipe and my homemade keto hot chocolate mix recipe. In my keto double chocolate chip cookies, I’m using coffee. Yum! So what’s our secret, flavor enhancing ingredient in this recipe? Just the right amount of instant coffee. But don’t forget the salt, of course! My skin doesn’t love almonds, so it’s no secret that I choose coconut flour over almond in most of my recipes. But coconut flour is also a more economical choice. Seriously! I hear from readers all the time who want to know how they can save money on low carb baking ingredients. Not only is coconut flour more absorbent (meaning you need a whole lot less of it), but ounce vs ounce it is typically much less expensive than almond flour. Coconut flour is also a great source of fiber. And since it’s not actually a botanical nut, coconut is often a fantastic option for anyone that needs to stay tree-nut free! I’m loving allulose right now. Its clean flavor is the closest thing I’ve tasted to real sugar, and as a Type 1 Diabetic, it doesn’t affect my blood sugar. But Allulose also has a magical effect on the texture, making these cookies soft and chewy! Unlike erythritol, allulose doesn’t recrystallize in baked goods as they cool. Allulose actually makes cookies chewier and even helps provide the structure that’s often missing in gluten-free baked goods, without any grittiness. Have you heard that xylitol is a great low carb choice? As a Type 1 Diabetic, I’ve found that xylitol isn’t actually as keto-friendly as I once thought it was! In fact, it causes a significant spike in my blood sugar and requires a lot of insulin. But the thing is, someone who’s not Type 1 will have no way of knowing since their body makes endogenous insulin. After joining a low carb Type 1 support group I discovered that most experience the exact same thing. So long, xylitol! Xylitol is toxic to dogs and even very small amounts can be lethal. We have two little pups at home, and after hearing multiple scary stories, we decided the danger’s just not worth it! What’s The Difference Between Unsweetened Chocolate And Cocoa Powder? Unsweetened chocolate contains both cocoa solids and cocoa butter, while cocoa powder is simply de-fatted cocoa solids. So why use chocolate in this recipe? In my keto double chocolate chip cookies recipe, the cocoa butter is acting as a substitute for additional fats, such as butter. If you’ve ever tasted pure cocoa butter, you know that it contributes a silky and rich chocolate flavor. So think of it as one more way to inject extra chocolatey goodness that we wouldn’t get by just using cocoa powder and butter alone. There’s often a misconception that baked goods made with chocolate would be drier than those made with cocoa powder due to cocoa butter being solid at room temperature. In fact, the melting point of cocoa butter and butter overlap, and cocoa butter melts perfectly at body temperature – ie on your tongue! Dryness is more likely to be a function of overbaking, or the recipe’s overall moisture content. I’ve been eating low carb for years, and I’m constantly amazed by the new, keto-friendly products that are available. For example, keto chocolate chips. For my keto double chocolate chip cookies, I used KNOW Foods low carb chocolate chips. I like these chocolate chips because they’re sweetened with allulose and only contain three ingredients: natural unsweetened chocolate (cocoa beans), allulose, and additional cocoa butter. I recommend price checking them on both Netrition and Amazon. You can find KNOW Foods chocolate chips on Netrition by clicking here or find them on Amazon by clicking here. Lily’s Dark Chocolate Premium Baking Chips are another great keto-friendly choice. In addition to the advertised stevia, they’re also sweetened with erythritol and inulin, so keep in mind that they may cause digestive discomfort for some people. If that’s you, I recommend trying out the allulose sweetened KNOW Foods chips listed above. Chocolate chunks are always a delicious choice when you’re making chocolate chip cookies! If chocolate chunks are your preference, just grab a few Lily’s chocolate bars on Amazon to have on hand. You can usually find them locally at Whole Foods stores as well. Simply chop them up with a large chef’s knife any time you’re making chocolate chip cookies! Unsweetened cocoa nibs are the cleanest, most unprocessed choice. They are literally just delicious, crunchy cocoa bean bits. Just be careful to check labels and nutrition info, because some brands sweeten their cocoa nibs! 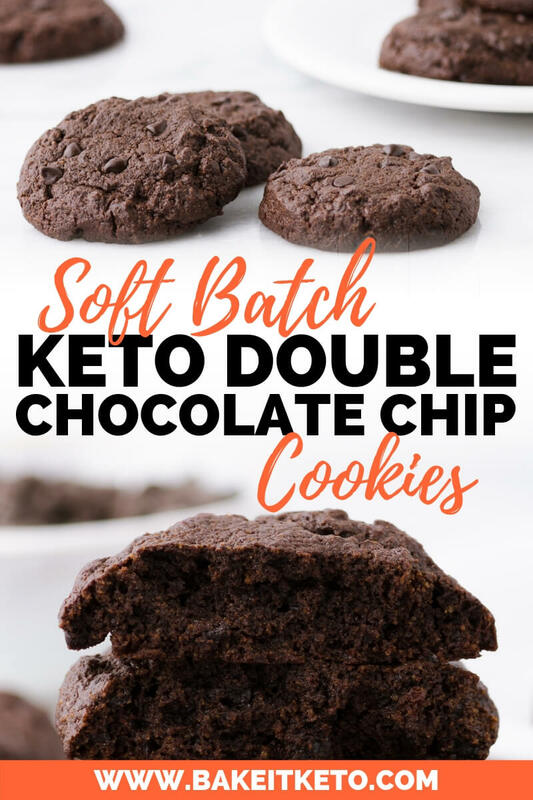 These no-fail soft batch keto double chocolate chip cookies are intensely chocolatey and fudgy. With a secret ingredient that makes these low carb cookies over the top delicious! Prepare a cookie sheet with parchment paper or a silicone baking mat. In a small bowl, combine coconut flour, baking powder, and salt, (sifting the coconut flour if yours is lumpy). Set aside. In a heatproof bowl, melt together the chocolate and butter over a double boiler (or use a heatproof, microwave-safe bowl and melt very carefully in 20-second increments). Set aside to cool. In the bowl of a stand mixer fitted with a whisk attachment, combine the egg, allulose, vanilla, and instant coffee. It will seem like too little liquid at first! Whip the mixture on high speed for 5-7 minutes. It will become very light and thick, and the allulose and instant coffee will have begun to dissolve into the egg. Using a rubber spatula, fold the chocolate mixture into the egg mixture. Then fold in the coconut flour mixture, followed by the chocolate chips. Scoop the cookies onto the prepared baking sheet and bake at 325 degrees F for 12-15 minutes. WANT TO SAVE THESE LOW CARB DOUBLE CHOCOLATE CHIP COOKIES FOR LATER? CLICK HERE TO PIN THIS RECIPE TO YOUR FAVORITE KETO PINTEREST BOARD!